Over the last several months, we have been focused on making Wordfence a better option for organizations with a large number of WordPress sites to protect. To start, we added the ability to secure your staging and development environments with a single Wordfence premium license, something you should take advantage of if you haven’t already. Next we changed the way we handle volume discounts to make managing a large number of sites easier. Shortly after that we launched Wordfence Agency Solutions, empowering our client partners to develop custom security solutions for agencies and our enterprise customers. 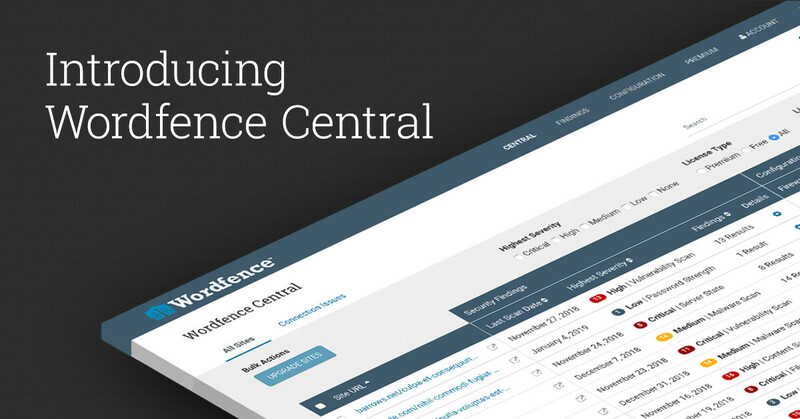 Today we are thrilled to announce the launch of Wordfence Central. Wordfence Central provides an efficient way to manage the security of many WordPress sites in one place. It includes a powerful dashboard, a single interface to view and manage security findings across all of your sites and powerful new tools that make managing Wordfence configuration for your websites a breeze. There’s no catch, it’s really free. You’re welcome to use Wordfence Central to manage all of your websites at no charge. There are no limits or restrictions of any kind. The Wordfence Central Dashboard shows you the security status of your websites at a glance. A high level summary of the latest scan tells you how many issues were discovered, along with a brief summary of the highest severity findings. You can view detailed findings with a single click, never leaving Wordfence Central. High level metrics show you the current configuration status for the Wordfence firewall and scanner. The Premium license status lets you know which sites need to be upgraded. You can upgrade sites and update their configurations in just a few clicks, without ever leaving Wordfence Central. Powerful sort, filter and search capabilities make managing even hundreds of sites a breeze. Before Wordfence Central, keeping up with Wordfence scan results meant either visiting your sites regularly or reading through a constant flow of email alerts. Now you can view the current status of all your sites in one place, and drill down to view detailed findings without leaving Central. In many cases you can take action on a finding without leaving Central. When you do need to visit your site to deal with a security finding, Central makes it easy by taking you to the relevant page with a single click. If your site hasn’t been scanned recently, no problem! Launch a scan in Central and watch the results stream back in real-time. The default Wordfence configuration works for most site owners, but advanced users tend to make changes. As someone responsible for multiple sites, this can be a daunting task. With Wordfence Central you can now make those changes quickly and efficiently. 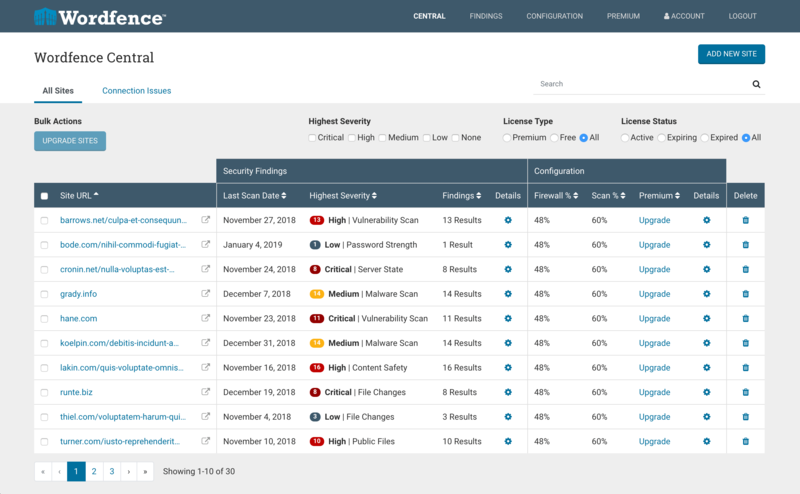 When you first land on the Configuration page in Wordfence Central you are greeted with a high level summary, showing you the current firewall, scan and premium license status for each site, whether a template has been applied to it and whether its configuration still matches the template. More on the magic of templates later! To view or make changes to a site’s configuration you can simply click the “Manage Site” link, which will bring you to the equivalent of the “All Options” page in the Wordfence plugin. Once the changes you need to make are complete, hitting “Save Changes” will send your changes down to your site in seconds. It’s that easy. The real configuration workhorse in Wordfence Central is templates. Templates give you the ability to create and manage as many Wordfence configurations as you like. For example, you might want one template for your VIP clients and another for everyone else. Templates make configuring new sites incredibly easy. Simply add the new site to Central, navigate to Configuration and apply a template to the new site. This will take care of 99% of the settings in Wordfence. Enabling “extended protection” for the firewall, which is strongly recommended, still requires a visit to the admin area of your site. To get started with Wordfence Central, go to wordfence.com/central. You’ll be greeted with a high-level overview of Central including screenshots. To dive right in click the “Get Started” button. You will need to sign in or create an account if you don’t already have one. Once you’re logged in you will be asked to set up two-factor authentication, or 2FA, for your account. It’s optional, but we strongly recommend that you set it up. Wordfence Central will have the ability to make changes to how Wordfence is configured for all of the sites you connect, so we want to take extra care to keep your account safe. Once you’ve set up 2FA, you will be prompted to connect your first website. After you submit the site URL, Wordfence Central runs a quick series of connectivity checks. If everything checks out your site is added and you will be prompted to add another. It’s that easy. Tomorrow morning (Thursday) at 8am Pacific / 11am Eastern Mark Maunder, our CEO, will be live-streaming a Wordfence Central demo followed by Q&A. You can attend by visiting https://wordfence.com/blog/2019/02/wordfence-central-livestream/. Submit your questions via the comments for that post now and during the event. We couldn’t be more excited about launching Wordfence Central this week. We hope it will make life easier for you, whether you manage three sites or three thousand. New features are already in the works, so expect to see additional functionality released throughout the year. As always we’d love to hear from you in the comments and we hope you can join us for tomorrow’s live-stream demo and Q&A! The post Introducing Wordfence Central appeared first on Wordfence.